OK, let’s get this one out of the way. It was recently brought to my attention that Timothy appears in Kenneth Anger‘s notorious book, Hollywood Babylon II (1984), in the chapter entitled “Babylon Boozers.” I admit that Anger’s first Babylon book was an old guilty pleasure of mine, but I had not seen the second one. I acquired the book, checked out the chapter in question, and indeed, this photograph appears. 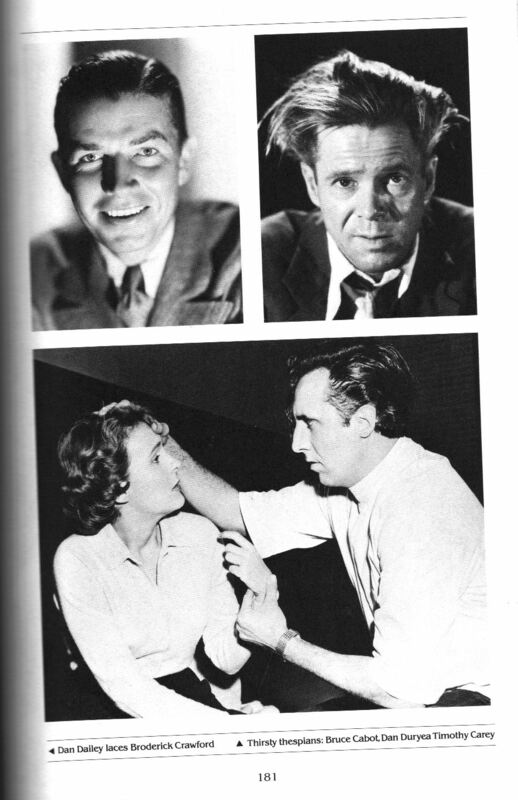 Here we see Tim in his well-known publicity still from Unwed Mother (1958), with the caption declaring that he was one of the “thirsty thespians.” It’s worth noting that this chapter is comprised of captioned photographs only. There is absolutely no anecdotal evidence presented to back up Anger’s insinuations about anyone in this chapter, not just Timothy. He would have beer and smoke cigarettes, and he would get a great kick out of me ordering 7-Up. “I don’t need any synthetics for my kicks, Jimmy,” I told him. “You have something there,” he nodded. Kenneth Anger is indeed a gifted filmmaker, but his hatred of the city and the industry that birthed him and ultimately rejected him is obvious, and legendary. Everything in the Babylon books needs to be taken with a humongous grain of salt. For a truly eye-opening experience, I highly recommend Anger: The Unauthorized Biography by the late Bill Landis. This entry was posted in Books, Film and tagged anger: the unauthorized biography, bill landis, east of eden, film comment, grover lewis, hollywood babylon, hollywood babylon ii, james dean, kenneth anger, the highways of heaven, timothy carey, unsubstantiated rumors, unwed mother. Bookmark the permalink. I also did a little research on the other actors on this page. Bruce Cabot’s drinking buddies included John Wayne and Errol Flynn, so yes, he was a bit of a boozer. However, I can find no evidence, at least after some cursory research, that Dan Duryea had any alcohol problems. He *played* alcoholics several times, but I found no evidence that he was one in real life.